Marty, I think a theory needs to be able to withstand questioning from all angles to test its validity. That becomes the strength of the theory. I have talked with many people about the different theories and the TIGHAR Niku theory is the only one that has strength due to the nature of the science and the evidence that exists. However this theory is not accepted as the final answer in the puzzle. Someone has decided a smoking gun is required. The Electra or some other hard evidence as yet unfound. In the current absence of that smoking gun I believe it is productive and healthy to prod at the theory to determine if there is something that was missed, overlooked or that can be learned to add additional strength. I, too, believe this forum is an excellent tool for playing "what if" scenarios. Your "moot point" comment suggests something different. Are we to only test the theory in certain ways? I believe this forum works exceptionally well BECAUSE it allows freedom to ask questions and get answers from like minded individuals. Even off the wall or seemingly time wasting points. They all deserve attention because one of them may help the theory become reality. My 2 cents. GMT (1912 - 1740) = 1h32m @ 130 kts = 200 nm off Howland , for direct approach . GMT (1912 -1815) = 0h57m @ 130 kts = 134 nm (neither 100 nm nor 100 sm) . Does anybody know what distance unit Noonan (ex-sea navigator , said to have accounted for nm & kts) used for his in flight on paper messages to Earhart ? (did he p.e. measure nm and first multiply by 1.153 before sending the paper off ?) . I think a theory needs to be able to withstand questioning from all angles to test its validity. That becomes the strength of the theory. That is a great theory. In practice, "questioning from all angles" costs time and money. Given limited resources, the TIGHAR board and its agents decide what projects are worth funding. Right now, the exploration of Niku has a higher priority in TIGHAR's approach than developing another flight simulation. No one is stopping you from creating your own models and offering your own conclusions. I have no doubt about what the exercise will show: the probabilities of various flight paths approximating the real path taken by the aircraft will vary with the assumptions made in the construction of the model. Different conclusions flow from different premises; if we had more data, we wouldn't have to guess about the premises of any one model; in the absence of data, many models can be built that lead to different conclusions. I have talked with many people about the different theories and the TIGHAR Niku theory is the only one that has strength due to the nature of the science and the evidence that exists. However this theory is not accepted as the final answer in the puzzle. Someone has decided a smoking gun is required. The Electra or some other hard evidence as yet unfound. In the current absence of that smoking gun I believe it is productive and healthy to prod at the theory to determine if there is something that was missed, overlooked or that can be learned to add additional strength. Poke and prod away. I have explained why I won't try to code another simulation and why I think it is unlikely that TIGHAR will code another one, either. You are a free agent and may do as you please with your time and money. I, too, believe this forum is an excellent tool for playing "what if" scenarios. Your "moot point" comment suggests something different. Are we to only test the theory in certain ways? I believe this forum works exceptionally well BECAUSE it allows freedom to ask questions and get answers from like minded individuals. You can't have it both ways. I am evidently not like-minded to you. I express my conviction that there is a limit to the value of playing "what-if" games; you disagree with me. When you question me, you see it as exhibition of the glorious freedom of skeptical inquirers to ask questions; when I disagree with you, you portray it as close-mindedness. Even off the wall or seemingly time wasting points. They all deserve attention because one of them may help the theory become reality. My 2 cents. I respectfully disagree. I question your evaluation. Here is my argument against your view: We do not have an unlimited budget to play with. We have to select certain lines of inquiry that seem fruitful and neglect others that we think are less likely to produce results. ﻿There is no reason to think that Noonan had not been able to get celestial fixes. I disagree. It is true that at 02:45-48 Bellarts logged, "HEARD EARHART PLANE / BUT UNREADABLE THROUGH STATIC" but that is not the only primary source documentation of what occurred. Associated Press reporter James Carey was in the radio room. His rough notes, taken at the time, and his diary document that he heard Earhart say "sky overcast." Friday, July 2---“Quiet everybody,” yelled one of the radiomen at 2:48 AM, “I think I’ve contacted the plane.” A pin-drop silence ensued. With my ears to the phones, I could hear the voice of Amelia Earhart, somewhere out in the South Pacific, speaking on the voice phones. “KHAQQ calling Itasca; KHAQQ calling Itasca,” she said and then the static drowned out a part of the message. “Sky overcast,” she continued somewhat audibly, and that was all for the rest of the message was lost in noisy rumblings of static interference. Why does Carey contradict Bellarts? Note that Bellarts says the transmission began at 02:45 and ended at 02:48. Carey's references are all at 02:48. They're listening on headphones, not a speaker. I suspect that what happened is that Bellarts heard something over his headphones that convinced him that he was hearing Earhart but he couldn't make out the words. He yelled, "Quiet everybody" as Carey says and then he either passed his headphones to Carey or Carey plugged in another set. In any event, Carey heard what he heard. You can choose to believe him or not, but his notes stand as a contemporary primary source document. the plane could reverse its course and return safely to the departure airport. If Noonan thought he had a 24 hour endurance, using the 23 knot wind component that he measured in flight then he would have calculated the PNR as 1407 Z at 1511 NM from Lae, just five hours and 710 NM short of Howland. "Would have" is a guess masquerading as fact. Chater reported that at 5:18 pm Lae time, Earhart was heard to say "POSITION 4.33 SOUTH 159.7 EAST HEIGHT 8000 FEET OVER CUMULUS CLOUDS WIND 23 KNOTS." She did not say whether the wind was a headwind, tailwind or crosswind. By your own reasoning, if it was a headwind they should have turned back. It also turns out that there was an airport at Rabaul, 344 NM along the course line to Howland. returned safely to Lae or Rabaul and try again another day. What evidence do you have to support your claim that there was an airfield at Rabaul in 1937? The Wikipedia page on The Bombing of Rabaul says there were two "pre-war Australian strips" on Rabaul - Lakunai and Vunakanau - but does not say when they were constructed. The Wikipedia pages for Lakunai and Vunakanau say they were constructed by the Royal Australian Air Force. To my knowledge, the RAAF was not building airfields in the region in 1937. You seem to have gone to great lengths to try to prove that Earhart and Noonan should have reached Howland and shouldn't have reached Gardner, and yet there is abundant evidence that they didn't reach Howland and did reach Gardner. Thanks Marty. I appreciate you taking the time to respond. One of the great points in this forum is that we get to read about how others think. Too often however the interepretation of what is said is either mistaken or just isn't clear. You made the comment to Mark Petersen; "TIGHAR is up to its neck in funding the interpretation of the last expedition and designing the next. The organization is sold on the Niku Hypothesis. All you get from the simulation is a sense of how the aircraft may have ended up at Niku; knowing the exact path is of no use whatsoever in searching for the wreckage or other telltale material from AE and FN. The whole question is moot: something about which reasonable people may reasonably disagree; something that can be argued endlessly; something that makes no difference to the next steps that need to be taken." It was the sentence "The whole question is moot: something about which reasonable people may reasonably disagree; something that can be argued endlessly; something that makes no difference to the next steps that need to be taken." that threw me off. It seemed to suggest that we shouldn't waste any time thinking about the past work only to think to the future work on the entire Niku theory. Your response clarifies what you mean and it was in reference to doing studies that have been previously done, amongst other work. Good point. I also believe that TIGHAR and its advisory council must decide where to spend scarce and valuable resources. I believe I am priviledged to be able to access this forum and participate but would NEVER presume to suggest or instruct what direction it should take or how to spend its money. Sorry but thats for the advisory council and members like yourself who have vast amounts of history and experience in this matter. I see the forum only as a mechanism for discussion. From these discussions I hope the advisory council may see threads of direction. Sure a lot of ground gets repeated. Even in my short time in this forum I see repetition that even I might be able to answer but there are many experts who also participate and the answers are usually pretty quick and complete. Those same experts may also enjoy the challenge of creating a new Monte Carlo simulation or graphic as some people enjoy doing this. But you're right that if we want to see something like that and have the time to "waste" then go for it. That's a fair comment. I enjoy reading posts from a number of people on this forum and you are one of them. I just want to clarify this comment you made. "I am evidently not like-minded to you. I express my conviction that there is a limit to the value of playing "what-if" games; you disagree with me. When you question me, you see it as exhibition of the glorious freedom of skeptical inquirers to ask questions; when I disagree with you, you portray it as close-mindedness." Questioning someone can also mean you are trying to understand their point more clearly. I don't disagree with you. I never said I disagreed with you. But my questions to you elicited an answer that clarified your point. We can always agree to disagree on some points and agree on others. That's the beauty of free speech and a respectful forum. But questioning someone's opinion is not always disagreement nor close mindedness. For the future please understand that I have the utmost respect for Ric, yourself, and all the many forum participants who venture to share their thoughts, comments, opinions, experience, anecdotes and ,yes, even the jokes. "...So these two cases mark the bounds of the possible uncertainty in the north and south direction, 47 NM if the last fix was obtained at 1623 Z and 30 NM if the last fix was obtained as late as possible (clouds permitting) at 1740 Z. Either way they would not have flown for hours southward still expecting to find Howland. I am glad we have a forum here at TIGHAR. If I could see where anyone else had done a credible job of back-tracking the flight, etc. and come up with something more reasonable than a Niku landing possibility it would be more interesting to follow. So far, however, TIGHAR is the only outfit I've found that has exhausted the tedious details available to us and come up with anything reasonable. Sad, but conjecture to the contrary for the sake of trying to tear-down a good theory (which is backed by a growing body of evidence) just doesn't seem worth the read after a point; I only have so much time. As I think about it, I could start coming up with reasons why we never really went to the moon... and never mind those pictures NASA now has of man's foot trails and trash up there. Gee, if NASA can get pix like that for a few billion bucks, then me thinks the 7 site artifacts are well worth the scrutiny and personal investment on my part - so far it's the best AE trail anyone has found. Couldn't agree more. You would think that with the money spent by the military in the Pacific alone they would consider a complete water search off Niku as an excellent training exercise if nothing else. I was born in 1954, only 17 years after AE and FN went missing. My father had told me about AE when I was very young. The information of the day was completely flawed and incomplete. I had no idea AE had a navigator with her until many years later. In fact I was told, and believed, the crash at sea story and believed it as there was no alternative presented. A year ago I discovered the TIGHAR site and plowed through many of the research papers and documents. (Sorry Marty but I have forgotten so many points that I will go back and read them again so I can link properly.) I believe the Niku theory IS true. Too much circumstantial evidence to be wrong. However thats why I suggested with this thread that we think backwards and see if we can bring any new ideas to bear. Any new leads in finding a smoking gun would help, while Ric and crew find funding for the really hard parts. Perhaps we should suggest to Google that mapping the land surfaces are done so lets go map the ocean floor. Perhaps that view would reveal something? mapping the ocean floor is an extremely difficult task. It isnt like a satelite orbiting above, taking endless pictures. But, oh boy, the possibilities of mapping the ocean, and reefs. Lets have them start----At Niku! Wouldn't they just have a bunch of little one man subs with cameras mounted on them? Well said and this represents my perspective as well. The problem with forum posts, email and written correspondence in general is that nuances are lost and it's possible for people to misread the intentions of the writer. Just to clarify, I don't think that anyone is raising doubts about the Tighar Niku theory. It is and continues to be the best theory of what happened back in 1937. When I've asked questions of Ric or others in this thread its not been to cast doubt on what is being said, but rather to learn more about something and in particular to learn why our Tighar members feel the way that they do. Ric and the other Tighar EPAC members are recognized experts in the Earhart field and have a wealth of knowledge in this area, so it doesn't seem unreasonable that members would frequently ask questions of them. In fact one of the things that I most like about Tighar is that there is an open forum where people can ask questions. There is a give and take spirit on this forum whereby members can learn more about the Earhart disappearance. It should be realized though that these questions, at least in my case, aren't an indictment of what is being said, but truly a desire to learn more. As far as Tighar funded research goes, I heartily agree that any funds should go where needed. The beauty of a mathematical model though is that there is no cost involved, only the time of the person who volunteers to construct it. I don't think that the inputs to the model can hope to be accurate without feedback from the Tighar EPAC group though, therefore I doubt that the results will be accurate if done as a solo effort. At least that's my current thinking. If Ric and the other EPAC members don't have the time to devote to it, that's understandable though. One last point, I seem to have dredged up a sore point by bringing up the Monte Carlo Simulation (actually it was someone else who brought it up, but I was the one who asked questions about it). My questions about it were based on a desire to learn more about it (engineers brains are wired that way), so again I hope that people don't get the wrong impression about the spirit in which these questions were asked. It should also be pointed out that working backwards by calculating the probability of 3 key constraints and then determining the intersection between them, as was the topic of this thread, is essentially a simple Monte Carlo Simulation, even if done on pad and pencil. I thought that the idea was a good one and continue to feel this way. I have an unimpeachable source for my statement.
" At quarter to three he [Bellarts] listened for her scheduled broadcast and heard a voice. It was barely discernable against the background noise, but Bellarts was sure he was hearing Earhart. The transmission lasted three minutes, and he could not make out a word of what she was saying. He typed: 'Heard Eahart plane but unreadable thru static' and notified the bridge that first contact had been made. "Commander Thompson, in his official report, later claimed that at this time 'Bellarts caught Earhart's voice and it came through loudspeaker, very low monotone 'cloudy overcast.' Mr. Carey, Associated Press representative, was present. also Mr. Hanzlik [sic] of United Press, both gentlemen recognized the voice from previous flights to and from Hawaii. There was no question as to hearing Earhart.' Overcast conditions would have prevented Fred Noonan from using star sightings to track the flight's progress. But the ship's radio logs do not support Thompson's allegations. Asked about the discrepancy many years later, Bellarts vehemently denied that he had heard Earhart say 'cloudy, overcast' and explained that, at that time the loudspeaker was not in use: 'That static was something terrific, you know, just crashing in on your ears. And I'll guarantee you that Hanzlick and that other joker never heard that. Oh. I would definitely be on the phones. Absolutely. Not on loudspeaker.'" - Ric Gillespie, Finding Amelia, page 87. You can't get any better source than that! Sure you can. When I wrote Finding Amelia, Bellart's log was the only contemporary written source we had from someone who was in the radio room. I was correct in siding against Commander Thompson's later claim that Earhart said "cloudy overcast" because there was no support for it. Finding Amelia was published in September 2006. We got out first clue to the possible existence of the Carey's notes and diary the very next month but it was February 2007 before we had them in hand. New documented information changed the picture. Bellart's recollections many years later may or may not be correct but if he passed the headphones to Carey as I suspect, he may have been absolutely correct in saying he never heard Earhart say that - but Carey's contemporary written notes trump Bellarts memory. That's interesting. Not to quibble about this point, but reporting an overcast at the time of a radio broadcast doesn't tell us about the conditions during the rest of the hour. Obviously they were satisfied with the accuracy of the navigation or they could have turned around and returned to Lae at the time of that first report and could have made it back to Rabaul up to the time of the second report as I showed with the point of no return calculation. But putting those two reports behind us, there is no dispute about the logged report of "partially cloudy" at 1623 Z, conditions that allowed Noonan to get a fix even if he had not been able to get one in the prior two hour period. Based on the normally accepted level of uncertainty for dead reckoning of 10% of the distance flown, from that point to 1912 Z it is very unlikely that their DR position would be more than 47 NM in error. You wrote in an earlier post that Earhart could DR to Gardner with only a 7% uncertainty, which is better than the standard, so would improve the accuracy of the DR position. So using your number, any error in the DR at 1912 Z is very unlikely to exceed 36 NM so they were not going to be far south of Howland, in fact, they would not have ended up south of Baker even with your maximum error, which is unlikely, since you are normally closer to the DR position than near the edge of the possible error band. These types of navigational errors have been extensively analyzed statistically. The most complete treatment of the statistics of navigational errors is in the American Practical Navigator, commonly known as "Bowditch," U.S. Navy Hydrographic Office Publication number 9 (H.O. 9) which is the standard navigational authority in the United States and has been since the first edition in 1802. Appendix Q of the 1977 edition is a 33 page discussion of this topic. There is only one chance in twenty of being outside the 10% DR error band and the probabilities drop off very quickly after that. The chance of being at twice that distance away from the DR position (94 NM in this case) is only one chance in 15,800 and being three times as far away is only one chance in five hundred and six million, eight hundred thousand, 1/506,800,000! So based on the science of navigation Noonan would never have gotten so far south of Howland so that it would have made any sense to abandon their efforts to find Howland and instead to fly off to far away Gardner. I never said that they should turn back just because they measured a stronger wind (presumably a headwind which would be expected as both forecasts called for winds out of the east) than originally forecast because they had planned on having a headwind and they had sufficient fuel reserves to deal with a stronger headwind. What I said was, if they were not satisfied with the accuracy of their navigation, such as not being able to get star sights, that they had the option of returning to a safe landing at Lae or Rabaul prior to reaching the point of no return. Since they did not make a one-eighty it must be obvious that they were getting enough fixes to be confident in their navigation. You may have not understood the computation of the PNR but the stronger the headwind the longer the time you have before you must make the decision to turn around. I used several possible headwind components and showed that differences in the time of arrival at the PNR. Look at them and you will see that the stronger the headwind component the later the time of the PNR. Perhaps a reductio ad absurdum example will make this clear. If they had 24 hours of fuel on board and were flying at 130 knots into a 130 knot headwind then they could wait the entire 24 hours and still be able to return to Lae since it would still be directly below them. Computing PNRs was standard long before the Earhart flight. You can find the formulas and the methodology in all standard flight navigation texts of the period including that written by Noonan's friend, P.V.H. Weems. Saying Noonan would have been able to calculate a PNR is stating a fact just as much as saying that Noonan could add two plus two and come up with four. 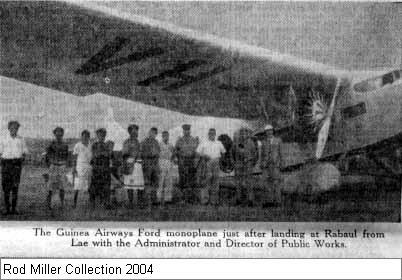 "After arrival at Rabaul, G-AUAA was fitted with an extra fuel tank, which enabled pilot ‘Pard’ Mustar to fly it to Lae on 31 March 1927 (some 720km, mostly over open sea). On 19 April, it became the first aircraft to land at Wau, the aerodrome for the goldfields (flown by ‘Pard’ Mustar, with a miner, named Taylor, as a passenger, probably to help him find Wau - it was Mustar’s 4th attempt to locate Wau and the flight took 45 minutes)." There were three airport at Rabaul in 1937 and the first one was built in 1927. The third airport was Kokopo. 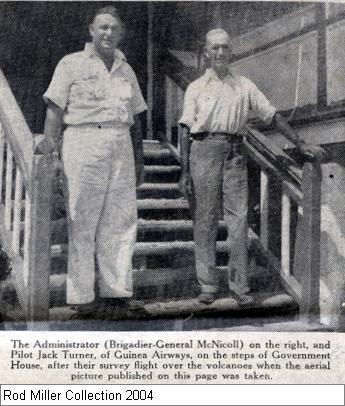 Here is a link to a newspaper article published on June 7, 1937 showing aerial pictures of the volcano at Rabaul and a photo of the plane that took them after it landed in Rabaul. So they could have returned to Rabaul after getting very close to Howland if they had not been satisfied with the accuracy of their navigation. It also make me wonder why they didn't depart from Rabaul instead of Lae since it was several hours flying time closer to Howland. Rabaul was also the administrative capitol of New Guinea so would have had better services and the permissions she had obtained would have been valid there also. Rabaul Takua airport is from Oct 1928 with asphalt runway.